Stitched together from cultured rat neurons, Gordon's primitive grey matter was designed at the University of Reading by scientists who unveiled the neuron-powered machine on Wednesday. Their groundbreaking experiments explore the vanishing boundary between natural and artificial intelligence, and could shed light on the fundamental building blocks of memory and learning. Observing how the nerve cells cohere into a network as they fire off electrical impulses, he said, may also help scientists combat neurodegenerative diseases that attack the brain such as Alzheimer's and Parkinson's. "If we can understand some of the basics of what is going on in our little model brain, it could have enormous medical spinoffs," he said. Gordon has a brain composed of 50,000 to 100,000 active neurons. Once removed from rat foetuses and disentangled from each other with an enzyme bath, the specialised nerve cells are laid out in a nutrient-rich medium across an eight-by-eight centimetre (five-by-five inch) array of 60 electrodes. This "multi-electrode array" (MEA) serves as the interface between living tissue and machine, with the brain sending electrical impulses to drive the wheels of the robots, and receiving impulses delivered by sensors reacting to the environment. Because the brain is living tissue, it must be housed in a special temperature-controlled unit -- it communicates with its "body" via a Bluetooth radio link. From the very start, the neurons get busy. "Within about 24 hours, they start sending out feelers to each other and making connections," said Warwick. "Within a week we get some spontaneous firings and brain-like activity" similar to what happens in a normal rat -- or human -- brain, he added. But without external stimulation, the brain will wither and die within a couple of months. "Now we are looking at how best to teach it to behave in certain ways," explained Warwick. To some extent, Gordon learns by itself. When it hits a wall, for example, it gets an electrical stimulation from the robot's sensors. As it confronts similar situations, it learns by habit. To help this process along, the researchers also use different chemicals to reinforce or inhibit the neural pathways that light up during particular actions. Gordon, in fact, has multiple personalities -- several MEA "brains" that the scientists can dock into the robot. "It's quite funny -- you get differences between the brains," said Warwick. "This one is a bit boisterous and active, while we know another is not going to do what we want it to." Mainly for ethical reasons, it is unlikely that researchers at Reading or the handful of laboratories around the world exploring the same terrain will be using human neurons any time soon in the same kind of experiments. But rats brain cells are not a bad stand-in: much of the difference between rodent and human intelligence, speculates Warwick, could be attributed to quantity not quality. Rats brains are composed of about one million neurons, the specialised cells that relay information across the brain via chemicals called neurotransmitters. Humans have 100 billion. "This is a simplified version of what goes on in the human brain where we can look -- and control -- the basic features in the way that we want. In a human brain, you can't really do that," he says. Those of you who have heard my lectures know I often talk about "smarter than human intelligence," and with it's advent the imapct on the human race as we move close to the idea of "the Singularity." 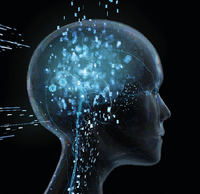 In order to achieve the Singularity we first must fully map and understand the human brian and one such ambitious project to create an accurate computer model of the brain has reached an impressive milestone. Scientists in Switzerland working with IBM researchers have shown that their computer simulation of the neocortical column, arguably the most complex part of a mammal's brain, appears to behave like its biological counterpart. By demonstrating that their simulation is realistic, the researchers say, these results suggest that an entire mammal brain could be completely modeled within three years, and a human brain within the next decade. Right on target for my futurist predictions to date. "What we're doing is reverse-engineering the brain," says Henry Markram, codirector of the Brain Mind Institute at the Ecole Polytechnique Fédérale de Lausanne, in Switzerland, who led the work, called the Blue Brain project, which began in 2005. By mimicking the behavior of the brain down to the individual neuron, the researchers aim to create a modeling tool that can be used by neuroscientists to run experiments, test hypotheses, and analyze the effects of drugs more efficiently than they could using real brain tissue. The model of part of the brain was completed last year, says Markram. But now, after extensive testing comparing its behavior with results from biological experiments, he is satisfied that the simulation is accurate enough that the researchers can proceed with the rest of the brain. "It's amazing work," says Thomas Serre, a computational-neuroscience researcher at MIT. "This is likely to have a tremendous impact on neuroscience." 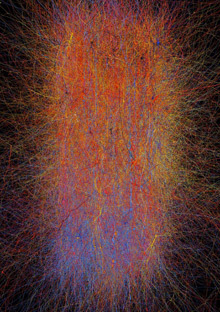 The project began with the initial goal of modeling the 10,000 neurons and 30 million synaptic connections that make up a rat's neocortical column, the main building block of a mammal's cortex. The neocortical column was chosen as a starting point because it is widely recognized as being particularly complex, with a heterogeneous structure consisting of many different types of synapse and ion channels. "There's no point in dreaming about modeling the brain if you can't model a small part of it," says Markram. The model itself is based on 15 years' worth of experimental data on neuronal morphology, gene expression, ion channels, synaptic connectivity, and electrophysiological recordings of the neocortical columns of rats. Software tools were then developed to process this information and automatically reconstruct physiologically accurate 3-D models of neurons and their interconnections. The neuronal circuits were tested by simulating specific input stimuli and seeing how the circuits behaved, compared with those in biological experiments. Where gaps in knowledge appeared about how certain parts of the model were supposed to behave, the scientists went back to the lab and performed experiments to identify the kinds of behavior that needed to be reproduced. In fact, about a third of the team of 35 researchers was devoted to carrying out such experiments, says Markram. Through an iterative process of testing, the simulation has gradually been refined to the point where Markram is confident that it behaves like a real neocortical column. However, none of these results have so far been published in the peer-reviewed literature, says Christof Koch, a professor of biology and engineering at Caltech. And this is by no means the first computer model of the brain, he points out. "This is an evolutionary process rather than a revolutionary one," he says. As long ago as 1989, Koch created a 10,000-neuron simulation, albeit in a far simpler model. Furthermore, Koch is skeptical about how quickly the brain model can progress. Any claims that the human brain can be modeled within 10 years are so "ridiculous" that they are not worth discussing, he says. Rat brains have about 200 million neurons, while human brains have in the region of 50 to 100 billion neurons. "That is a big scale-up," admits Markram. But he is confident that his model is robust enough to be expanded indefinitely. What's more, he believes that the level of detail of the model can also be taken further. "It's at quite a high resolution," he says. "It's still at a cellular level, but we want to look at the molecular level." Doing so would enable simulation-based drug testing to be carried out by showing how specific molecules affect proteins, receptors, and enzymes. "I wouldn't be surprised if they could do it," says Serre. "However, it's not clear what they could get out of it," he says. If you want this model to be useful, you have to be able to understand how the behavior relates to specific brain functions. So far, it is not clear that the Blue Brain project has done this, he says.